As a child of age 8 or 9 I read the story of Florence Nightingale I was entranced by this first Nurse who became known as the Lady of the Lamp. This story ignited fire in me. I wanted to be a nurse and care for those who were suffering. I never made it as a nurse but my life has been one of caring, not as a professional Nurse but as a mum and wife. I am here today to share some of my story. When I was 18 I had trained as a Nursery Nurse. I had this view of my future life. Children with 10 perfect toes. They would be good and easy to care for. I wouldn’t make the mistakes my parents had made. I would never put sugar on my babies dummy or let them drink sugary drinks out of a bottle. Even at the age of 18 I couldn’t wait to be a mother. I had met my husband John and married at the age of 19. I told John that I couldn’t cope with having a child with autism. He didn’t know anything about autism but he must have thought this was a strange thing to say. I had this fear of autism because as a student Nursery Nurse I had worked with a child who had Autism. This child was trapped in his own world and would walk from one corner to the other. He would fall to the floor and scream and hurt himself. His distress was palpable. I had asked the teaching staff if anyone could reach him but they said there was no point. They even sat on him during these episodes. I asked them why they did this and they said it was the only way to manage it. This was in 1984 when Autism was not well understood or provided for. This child had a massive impact on me. I felt that this autism wasn’t like any other disability. This child’s distress broke my heart and shattered my illusions. In my heart I felt that I could never cope with a child who was suffering so much and who couldn’t be reached. Every time I thought of autism a shiver went down my spine and I felt a sense of unrest. Little was I to know that autism was in the future to become such a part of my life. Next time I will talk about marrying my husband and having Ben, Naomi and Alex. Unless otherwise indicated, all materials on this page are © Alex Lowery Speaks About Autism. Please do not reproduce, modify or use for any purpose without the prior, written consent of the author. If you are interested in using an article on your blog or in your magazine, please contact us. Like you, my early experiences of autism were with children who could not verbalise in the way the rest of us do; could not or would not interact with others the way the rest of us do; and who behaved in ways that I could not (or maybe would not) understand. I too feared having a child with an autistic spectrum disorder. My eldest son – Liam – seemed to develop just as any other child. Speech and language development were good and everything seemed fine until school….what became clear very early on in primary school was that he didn’t play with other boys. He was always with the girls and they in turn ‘mothered’ him. He was bullied by the other boys and would never assert himself or defend himself – the girls stepped in to protect him. Otherwise – taking into consideration his left handedness, clumsiness and short-sightedness – he did well academically. But he had no friends – just the girls who ‘looked after him’. No-one seemed to think this unusual and he was always described as ‘a quiet and caring little boy, who was a delight to have in the class. I on the other hand was a mother looking for problems where none existed! At secondary school, the situation continued – except there were fewer girls interested in ‘looking after’ him as the years passed. Just a handful who still ‘look after’ him to this day – he’s 28 next month. Things came to a head when he reached 14. I was called into school one day, because Liam had hit another boy. The teacher was most apologetic. She was following school procedure following a classroom incident, but felt she had to defend Liam’s actions. His behaviour had been ‘out of character’; he’s always such a quiet and polite boy; the other boy had been bullying him….etc etc. Then he made his first ever male friend outside the family. Whatever this boy did or suggested, Liam copied to the point of putting himself in high risk situations. I managed to persuade a local ex-police officer who ran a Duke of Edinburgh Award and outdoor activities group to let him become a member – Liam had no interest in any of the things the group did, so he wasn’t an obvious candidate for a small group that prided itself on the physical, social and team-work ethics. When it came time to choose A level courses, Liam’s teachers strongly advised that he select sciences – his chemistry and physics teacher even came to see us at home to try to persuade him to take these subjects. He chose Music Technology; Law; and Psychology – the latter only because he couldn’t think of anything else! He passed his A levels and secured a place at Keele University – a small campus based Uni in a rural setting. Opposite the main office of the company I worked for. Which was fortunate, because for the first year I had to go every Friday to see him to try to persuade him to stay on campus for the weekend. More often than not I ended up taking him home. But there was good news – in addition to the little entourage of girls (all of whom mothered him) he met, he made a few male friends too! It took 5 years for him to complete his degree. By the end of the first year, a tutor had identified that he had ‘difficulties’ and referred him for a Special Educational Needs assessment. He was diagnosed as having severe dyslexia; dyspraxia; and dyscalculia. The Educational Psychologist was amazed he’d got as far in education as he had without help. 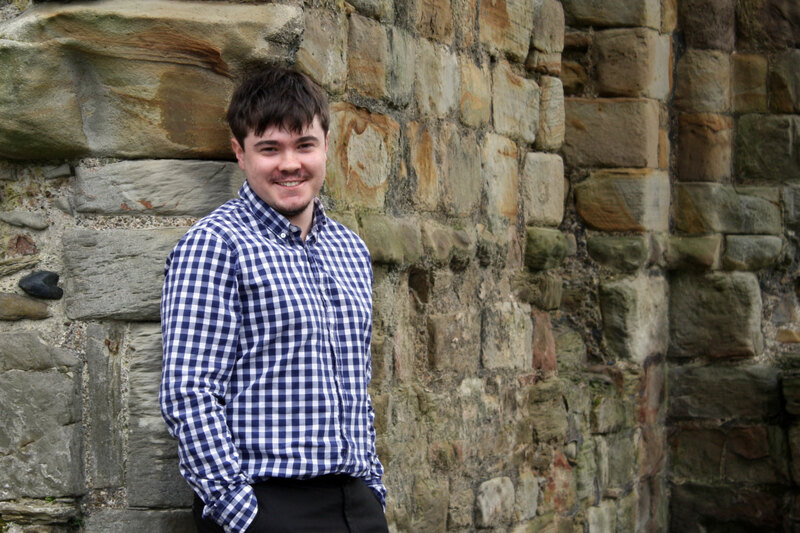 But what a pleasant and chatty young man he was…..
On the day Liam finally graduated from Keele, he left the ceremony and immediately – whilst still in cape and cap – announced he was going to do a Nursing degree with a view to later becoming a doctor. It was only 2 weeks ago – some 6 years later – that he told me he had insisted on doing the Music Technology course (his first degree) because he had thought he could use it to become a rock star. He’d known he was good at sciences at school, but had wanted to be a rock star…even though he could neither read music or play an instrument at the time! 2 weeks ago – the day Liam was told he had achieved a First Class Honours degree in Nursing and been accepted to work in the Cardiology unit of a Centre of Excellence for cardiac care – I finally got what I believe to be the answer to my question posed when he was in primary school – why my boy was ‘different’ to the other children in his class. Understandably pleased with the news he’d been given about his degree and confirmation of employment, he came to visit me at my business and was sharing his this with one of my customers, Fi – in her own words “an aspie”. She hadn’t met Liam before and hadn’t known he was my son. I hadn’t spoken to her about him. After telling her about his degree and new job, he told her about his motorbikes – she’s also a biker. Then he told her about his fish … and his fish tanks….and all the different types of fish he has….everything about his fish…. Later, Fi told me she likes Liam a lot. When I asked her why , she said ‘ because he’s like me’. In all innocence I said, ‘yes, he loves his motorbikes’ . No, she replied – I mean he’s ‘an aspie’! Liam is 28 next month. I can count on 1 hand the number of true friends he has – though he chats with and ‘knows’ hundreds more around the world – usually bikers or fish fanatics. His friends are all ‘odd bods’ in their own way, but to me they are the most beautiful young people on this planet. They accept Liam for who he is and are always ‘there for him’. And yes, the girls still mother him…but he has close male friends too, now. Sorry for going on so long, but it’s the first time I’ve ever told anyone our ‘story’. In so many ways I’ve failed my son – I knew his world wasn’t comfortable for him, but I couldn’t help him. Maybe if we had had a diagnosis when he was younger, things may have been different – maybe not. Probably not.